Happy Spring! 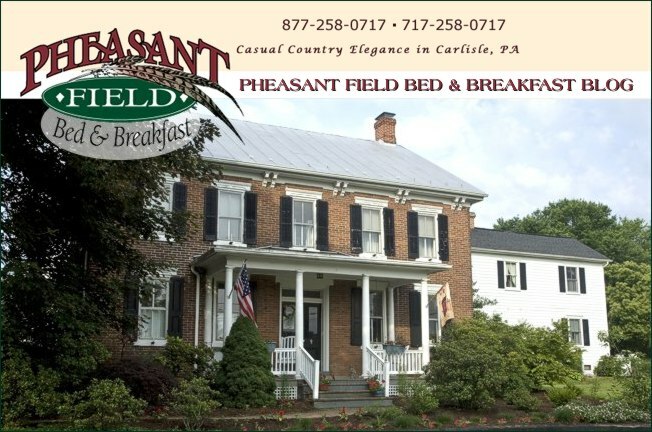 Now is a wonderful time for some birdwatching at Pheasant Field Bed & Breakfast. The 3 acre pond on our property has attracted Great Blue Herons, Snowy Egrets, Mallard Ducks (who have a nest), and other water birds. The Baltimore Oriole has returned and has a nest on the island. Our spring bulbs are brightening the landscape around the B&B. It's so nice to have our own flowers to cut and put into the guest rooms for your enjoyment! We have such wonderful guests who come from all around the world! Recently we've hosted folks from Florida - snowbirds who were traveling with their horses back home to Canada; from California - high school students visiting Dickinson College on their search for the right school; from London (yes - England) - another family visiting Dickinson; from Waynesboro, PA - a young couple celebrating their 1st wedding anniversary; from Dillsburg - some of our "regular" guests one of whom is celebrating a birthday; from New York - a family visiting their student at Messiah College. We enjoy introducing all these visitors to the beautiful Cumberland Valley and sharing in their special celebrations!